Sash windows are traditionally made out of timber, however different materials are also used to manufacture sash windows. Timber remains the most popular, despite the fact that moisture and weather can cause minor problems to the sash windows. Nevertheless, well maintained timber sash windows can last generations without the need for replacement parts. Overtime sash windows can become stuck and difficult to open or close. The cause of the problem could be related to the timber swelling in the frame, the sash itself or both. Often the swelling is caused by moisture, which enters the timber and swells or deforms the frame. This can lead the sash window to stick and possibly rot the timber. In this case the problem should be professionally addressed. Often people assume the moving sash part has expanded, so they trim it down. On the contrary, the problem can be related to the inner and/or outer lining of the box frame which has expanded. When linings are obstructed against the wall they tend to naturally expand inwards. The expansion forces the sash window to stick. The best way to deal with a swollen sash is to remove the sash from the frame. To allow the timber to dry out, you must strip the paint off back to bare wood. With the paint off, the timber will dry quickly and evenly. However, it could take a few days or up to a week for the timber to fully dry out. During this time, you should see it settle back to its proper and original form. For the last part, you need to repaint the wood with a water based primer and micro-porous paint, which will keep the rain off. Take caution when painting to not paint the sash itself stuck. Care must also be taken not to get paint on to any draught excluder which is fitted as paint can reduce the effectiveness of the draught excluders. Correctly painted sash windows so they do not stick together is a highly skilled job. Letting a professional painter carry out this task will result in a better and higher quality of finish. Painters such as those at yoursashwindows.com are highly skilled in this type of work. As old glue may have deteriorated over time, moisture can cause cycles of expansion and contraction and sometimes a bit of rot. This may loosen the joints of the sash window. The problem of the joints getting loose might create distortions. If they are ignored, moisture will penetrate the inner frame through the joints making the timber swell and also the window to stick and difficult to open. The joints can be fixed without dismantling the sash, as long as the timber retains enough structural strength. Make sure the joints are glued back in the right shape and don’t forget to check the glazing putty which must be solid and sound. Where a window has hinges, many of the older hinges are often invariably fitted with plain steel screws which slowly rust away. As more moisture enters the timber, the damper it becomes and the quicker the corrosion takes place. In the worst cases, the screws might have come loose. Fixing it by using larger screws is not the proper way of securing a hinge. It takes a bit of remedial work on the frame or sash itself to properly fix the problem. There are some solutions to this problem such as changing the hinge for one with a different hole configuration or just move the hinge. If one wants to repair the timber, it is suggested to first drill out the holes for the screws and use dowels. When the holes are drilled you can glue the dowel and let it harden. It is wise to drill a pilot hole and alternatively drill out and use a plastic ‘rawl’ plug. Always use plated slot head screws when screwing the window hinges. If the window is going to be painted removing the hinge will make the job easier. The common source of sash windows complaints is poor maintenance. 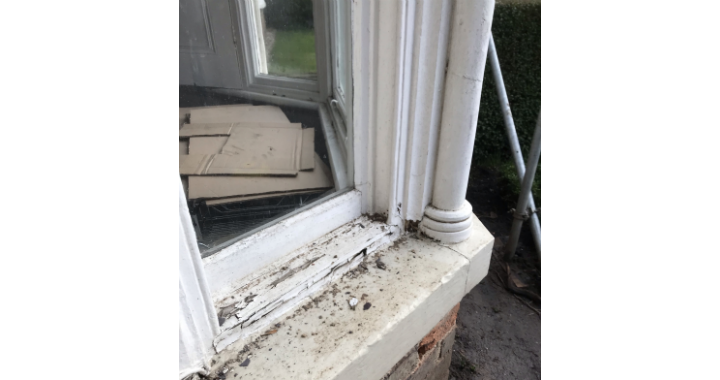 If timber sash windows aren’t maintained and re-painted regularly, they can negatively impact the home’s appearance and the functionality of the windows. As sash windows will always be exposed to weather damage, they respond well to a little TLC!